Indeed, Powell has been trying to de-emphasise the importance of the dots, because the Fed has abandoned its formal forward guidance and now wants to maintain flexibility to react to economic conditions. He specifically indicated the markets should not take the dots as a substitute for the forward guidance that the Fed has chosen to abandon, most recently in a speech at Stanford University. He repeated that message at the March policy meeting, but markets seem to have completely ignored it. In my view, the Fed has decided to keep interest rates on hold because it feels highly confident that once inflation starts to rise, it will be able to quickly pull it back under control. Given this, it prefers to stack the deck in favor of growth and let the economy run hot until it sees inflation move above the 2% target. The Fed is also confident that the risk of asset bubbles is limited—though there’s little doubt in my opinion that the markets are on a bit of Fed-fueled sugar high. I think these are secondary considerations. The United States and China seem headed towards an agreement on trade in the near term. Brexit tensions have risen ahead of the March 29 deadline, but it looks like the United Kingdom will now get a 6-9 month extension, which will push the issue to the backburner as far as markets are concerned. Separately, it is difficult to imagine that markets have the ability to be further shocked by an event that they have been anticipating for almost three years now. The main driver of Fed policy will remain the domestic economic outlook. As I noted in my February “On My Mind,” household consumption remains supported by a hot labour market and a robust balance sheet. As the global uncertainty diminishes, the US growth outlook will continue to warrant higher interest rates. All investments involve risks, including possible loss of principal. The value of investments can go down as well as up, and investors may not get back the full amount invested. 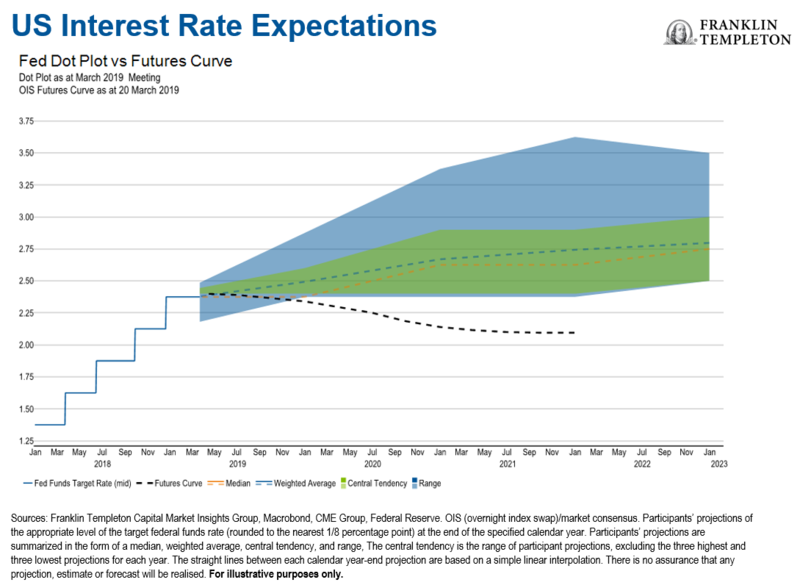 Bond prices generally move in the opposite direction of interest rates. Thus, as prices of bonds in an investment portfolio adjust to a rise in interest rates, the value of the portfolio may decline. Changes in the financial strength of a bond issuer or in a bond’s credit rating may affect its value. Floating-rate loans and high-yield corporate bonds are rated below investment grade and are subject to greater risk of default, which could result in loss of principal—a risk that may be heightened in a slowing economy.